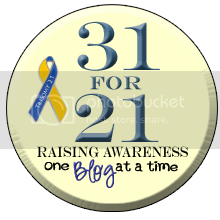 Yesterday, I was talking with a mom who has a teenage daughter with Down Syndrome. I was explaining how we found out about Tiana and the process of bringing her home. During the conversation, I realized something. Our experience and our emotions when finding out that Tiana has Down Syndrome is different than the mom who found out at birth (or during pregnancy) that her baby has Down Syndrome. I am not saying one way is better or worst but I do recognize that it is somewhat different, at least initially. When we found out about Tiana, we knew she had Down Syndrome right away. We educated ourselves about Down Syndrome (through books, doctors, workers, friends and blogs) and felt comfortable/excited about beginning the process of adopting Tiana. We knew it would be challenging at times but we also knew that it would be challenging with any child we bring home. Adoption is not all roses and we are realistic about challenges we will go through with each child. Loving our children trumps all and we knew Down Syndrome would not change how we love Tiana. This is our experience at the beginning. Then of course, actually raising Tiana brings a whole lot of excitement and new set of challenges. I feel we share many same feelings and thoughts as other parents with children who have Down Syndrome. We feel sad at times. We feel joy at times. We feel frustrated at times. We feel excited at times. And we feel love at all times. It might've started out differently for us but eventually, we all walk together in this journey. Thank you for welcoming us into the community and we look forward to making many more friends! Jill of All Trades. All over the place. A writer. A teacher. A quilter. A wife to an amazing man who puts up with a lot. Mother to two beautiful little girls who amazes me every single day. Proud pet-parent of Mack (dog), Oscar, Toby and Romeo (cats). Above all, a child of God. But still miraculously my own. You didn't grow under my heart - but in it."